Click to see special prix fixe menu for June 7! Join Margaret Perry, Armstrong Community Music School Director (Austin), for a preview of the Great Big Choruses program. Choral music that’s both great and big! 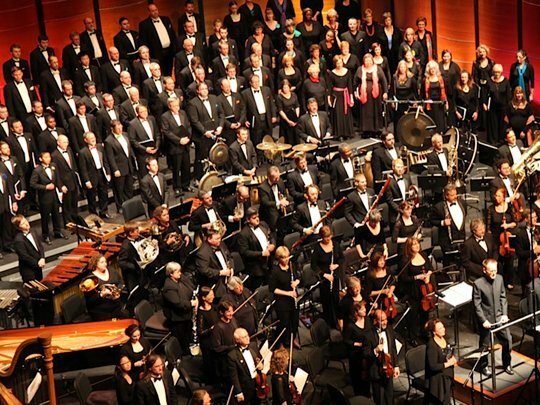 Conspirare Symphonic Choir collaborates with the Victoria Bach Festival Chorus and Orchestra to perform a crowd-pleasing program of great choruses from oratorio, opera, and Broadway. Including Beethoven’s “Ode to Joy” from the 9th Symphony, selections from Orff’s Carmina Burana, music of Brahms, Verdi, and more! The program will also include the world premiere of So Long as Days Shall Be, a short work by Donald Grantham (b. 1947) commissioned by Victoria Bach Festival. 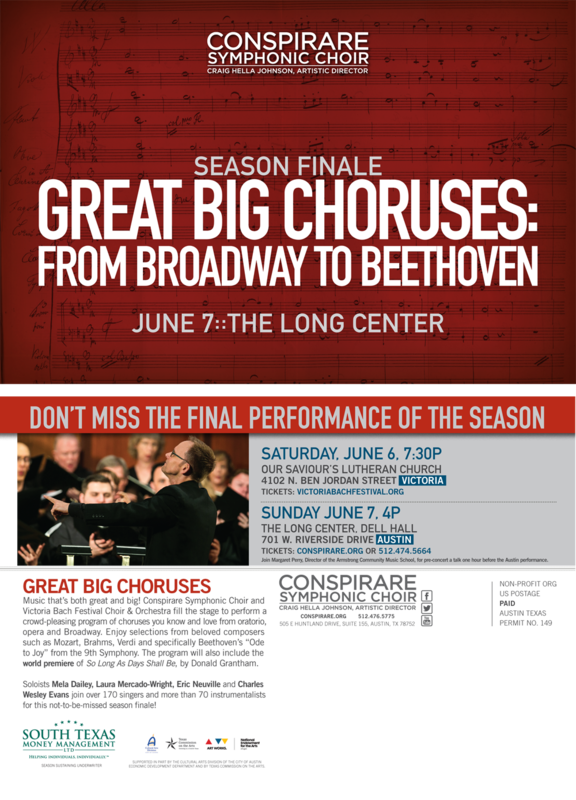 Soloists Mela Dailey (soprano), Laura Mercado-Wright (alto), Eric Neuville (tenor), and Charles Wesley Evans (bass) join over 170 singers and more than 70 instrumentalists for this not-to-be-missed season finale. 90 minutes of music with a 20-minute intermission. So Long as Days Shall Be takes its text from The Bay Psalm Book, first printed in 1640 in Cambridge, Massachusetts. This translation of the psalms was the first book in English to be produced in America, appearing just twenty years after the Pilgrims’ arrival. “Thirty pious and learned ministers,” including John Eliot and Richard Mather (grandfather of Cotton Mather of Salem witch trial fame) authored the work. Their translation is metrical, roughly-rhymed, and – in their view – closer to the Hebrew originals than the ones found in other psalters of the period. They sound rather eccentric to modern ears: none are now in common use and all have disappeared from contemporary hymnals. It was precisely this unfamiliar aspect that appealed to me as a composer, and I chose two of the most familiar psalms – 23 and 100 – to set to music. I heard these texts in a new and fresh way when I first read them because of the striking contrast with the traditional versions that I knew. Psalms 23 and 100 are very different in tone and character: the first is serene and pastoral, while the second, the Jubilate Deo, is celebratory and boisterous. The music proceeds from the first to the second without pause, and the settings share some of the same material.